Use a Medical Knee Scooter for Recovery! 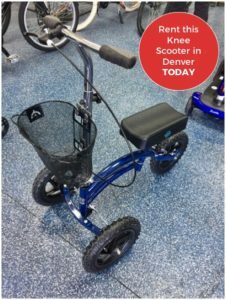 Use a Medical Knee Scooter for Recovery in Denver! There are many medical reasons that residents of Denver end up with compromised mobility. Renting a knee scooter can be the ideal solution. Too many people are still relying on crutches when they have a leg, ankle, or foot injury. There are some conditions where knee scooters are not the best option. But for most lower leg, ankle, and foot injuries, and for healing from surgeries, the knee scooter provides the best mobility. It also removes weight from the location of the leg that needs to improve, speeding up the time of your recovery. The strain that occurs around the home. Most of the time these injuries heal in time, but if we continue to use our feet and legs, as we are prone to do in these environments, small injuries can fail to heal properly. This condition can lead to more serious long-term problems with your feet, ankles, or legs. We see many people coming into because of small injuries that they chose to ignore. They are a common sports-related medical condition that requires a knee scooter during the healing process. They can also be caused by wearing high heels. Men over-the-age of 30 are prone to Achilles tendon injuries. They can be quite painful! You’re more likely to tear an Achilles tendon when you begin running or walking suddenly. Sprinters might become injured at the start of a race. Abrupt tensing of the muscle can be too much for the tendon to handle. Pain in the back of your foot and above the heel. You’ll feel this pain when you stretch your ankle or stand on your toes. The suffering can be sudden and quite severe if the tendon has ruptured, causing you not to be able to walk. Hearing a snapping or popping noise. Difficulty flexing your foot or pointing toes. Minor-to-moderate Achilles tendon injuries can heal on their own if you give your leg rest and time. Your doctor may prescribe medication to relieve pain and inflammation. More severe Achilles tendon problems may require visiting a physiotherapist. Ideally, you want to stay off your injured leg while healing from an Achilles tendon injury. Renting a knee scooter can be a smart option. FIND a model that fits your condition. Bone spurs (osteophytes) are bony protrusions along the edges of bones. Bone spurs usually form where bones meet each other in your joints. They also show up on the bones of your spine. Joint damage associated with osteoarthritis causes bone spurs. Most of the time you’re not going to feel any symptoms, causing bone spurs to go undetected, sometimes for years. In some cases, they can cause pain and loss-of-motion in your joints. Often people suffering from bone spurs don’t need treatment. Medical care depends on where spurs are located, and how the patient feels they are affecting their health. Gout is a common and complex form of arthritis that can affect anyone. It’s characterized by sudden, severe attacks of pain, swelling, redness, and tenderness in the joints, often the joint at the base of the big toe. Gout symptoms may come and go, but there are ways to manage symptoms and prevent flares. Gout occurs when urate crystals accumulate in your joint, causing inflammation and severe pain. High-levels of uric acid in your blood cause Urate crystals to form. Your body produces uric acid when it breaks down purines, natural substances found in your body. You’ll find purines in certain foods, like steak, meats, and seafood. Other foods also produce higher levels of uric acid, like alcohol. Beer and drinks sweetened with fruit fructose sugar are particularly useful at providing uric acid. Uric acid dissolves in your blood and passes through your kidneys into your urine. But sometimes your body produces too much uric acid. Your kidneys can also excrete too little uric acid. When both of these causes occur, uric acid builds up, forming sharp, needle-like urate crystals in the joint or the surrounding tissue. These crystals cause pain, swelling, and inflammation. The symptoms of gout often occur at night. They almost always happen suddenly. Medication is usually involved in the treatment of Gout. You and your doctor will need to choose the right medicine, based on your current health. Gout medications can be used to treat acute attacks and prevent future attacks. Drugs also reduce your risk of complications from gout, like the development of tophi from urate crystal deposits. Often people roll, twist, or awkwardly turn their ankle. When this happens, the ligaments (tough bands of tissue) stretch or tear. These ligaments help hold your ankle bones together, stabilize joints, and prevent excessive movement. When mistreatment forces the ligaments beyond their normal range of motion, a sprain can occur. Most of these injuries involve stretching or tearing to the ligaments on the outer side of the ankle. Treatment by doctors for sprained ankles depends on the how grievous the injury is. Many people choose to care for and medicate over-the-counter with pain medication and anti-inflammatory meds. A sprained ankle is also often treated by themselves, without the help of a doctor. A medical evaluation may be helpful in revealing how severe the sprain is, and determine the best treatment. Whether you’re working with a doctor, or you’re trying to heal on your own, you may want to come in and rent a knee scooter for a month. Staying off of your injury will be critical to your recovery. Can You Use a Knee Scooter for Knee Injury or Surgery? Usually not. When you’re recovering from an injury or surgery on your knee, you don’t want to put weight on it. It’s painful and not helpful to your healing process. People with knee recovery usually use wheelchairs. Usually, when you’re healing from some problem with your upper leg and thigh, like surgery on your femur, it’s recommended that you stay completely off of the leg. Knee scooters are not an appropriate mode of transporting yourself. Wheelchairs are going to be the ideal solution. If your injury or surgery is on the lower portion of your leg or foot, you’re probably a perfect candidate for renting a knee scooter. Consult with your doctor for your injury or surgery. FIND OUT why renting is better than buying a cheap scooter at Walmart!